Santo unveils a time machine he's invented with the aid of his sidekick, Perico (Alberto Rojas). Unfortunately no one believes him, so Santo finds a guinea pig in the form of Luisa (Night Of The Bloody Apes' Noelia Noel). Unfortunately Luisa winds up at the turn of the century with Dracula (Monti) prowling the streets. Soon Luisa falls prey to the smitten vampire (who also boasts of his treasure-filled coffin) but gets zapped back to the present. 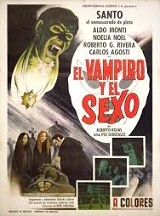 Unfortunately, Dracula's curse refuses to die, as Santo and his compadres team up to find the treasure and prevent the world from falling into the hands of the revived Count. (In Spanish language, with English subtitles).